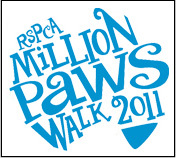 The Million Paws Walk is an annual national fundraising day for the RSPCA that will be held on the 15th of May this year. The RSPCA Million Paws Walk is the ultimate day for all pet lovers, owners and even those who don't have a pet but would like to join in raising funds for a great cause. The aim of the event is to get over 250,000 animals (which would make a total of one million paws) and their owners to get together and walk along designated routes in various cities and towns around Australia to raise much needed funds and community awareness for the care and protection of animals.